Start and finish dates: May 1864 to mid-1980s. Some eleven years after the first railway line in India had opened, railway sorting commenced on an experimental basis in May 1864 between Allahabad and Cawnpore. 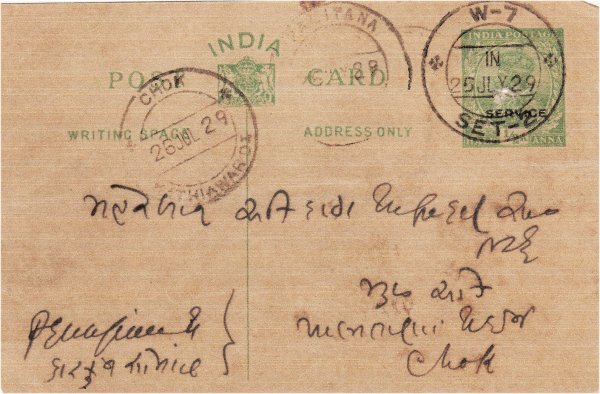 The purpose of the experiment was to simplify the despatch of mails to and from the North Western Provinces - previously the Calcutta post office had made up separate packets for each of the post offices on the 1019 miles of railway between Calcutta and Delhi (and vice versa). 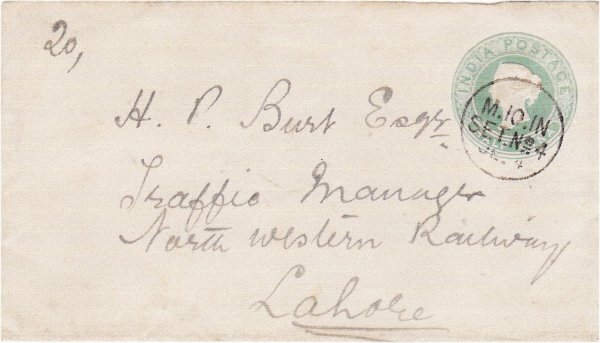 From May 1864 mail addressed to or from places beyond Cawnpore was sent to the 'Railway Sorting Office' for sorting. The experiment was successful and was made permanent in December 1864. 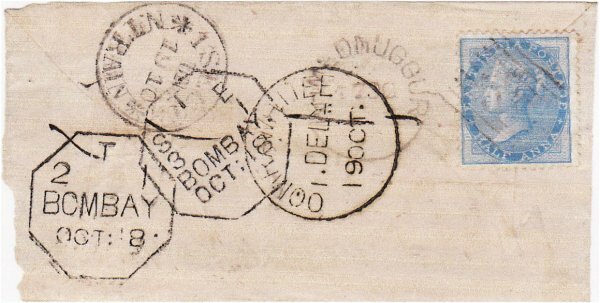 By late 1866 railway sorting had been extended, with four sections operating over the line between Calcutta and Allahabad and a further two between Cawnpore and Delhi. 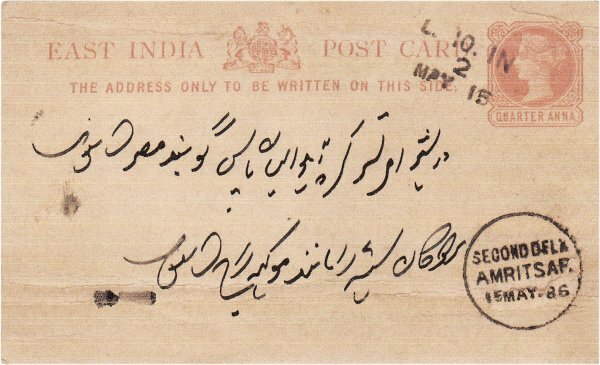 The growth of the railway system and the success of the operation on the East Indian Railway led to railway sorting for all mails passing between different provinces (in Indian terms 'frontiers'). 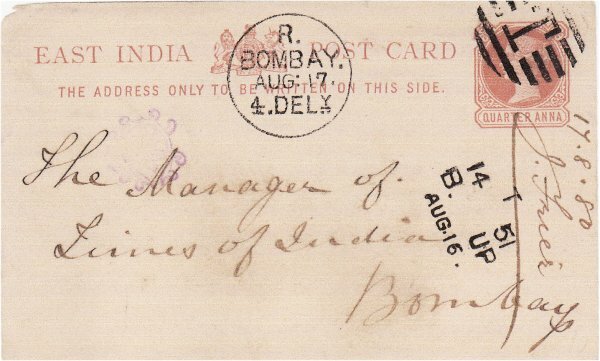 Thus Frontier Railway Sorting was established in 1869/70 - it also encompassed Local railway sorting for slow mails. 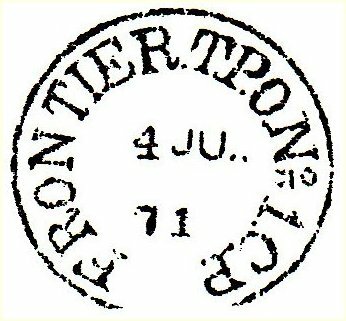 Railway sorting had spread to the Central Provinces, Oudh, Rajputana, the Punjab, East Bengal, Bombay and Madras by mid 1874, and Frontier Sorting was renamed the Frontier Travelling Post Office department, the first use of the term in India. 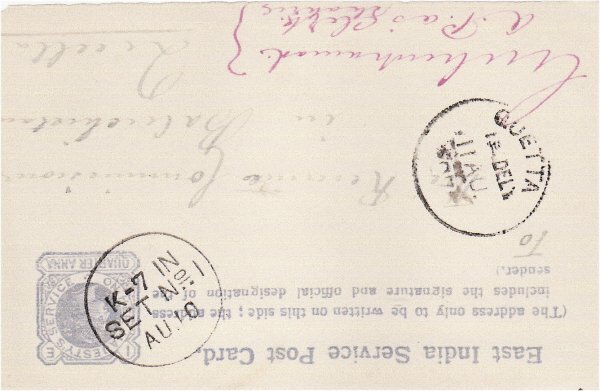 In these early days there was no consistent use of cancellations to denote railway sorting, each postal organisation or 'circle' making up its own in a wide range of types, most of which are exceedingly rare. 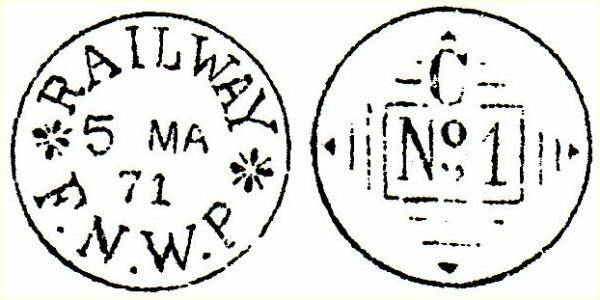 As railway sorting expanded from 1874/75 onwards, a degree of unified control became apparent in the use of standardised cancellations such as the octagonal marks illustrated, showing the name of a terminal station together with coded numbers which signify section (to identify the start and finish points) and set (to identify the crew). 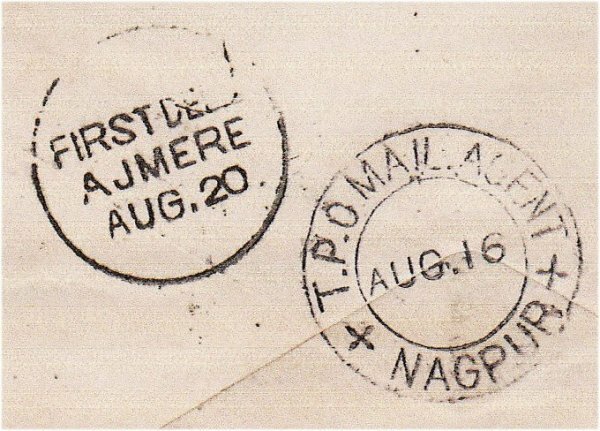 Other marks show reference to the mail agents whose function was to supervise the loading of mails to and from the TPO. 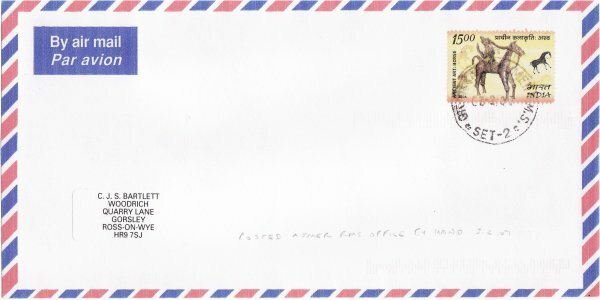 In 1880 the Travelling Post Office was taken over by the Railway Mail Service, which became responsible for sorting and despatch of all mail carried by rail and river steamers, an organisation which exists to this day. The RMS was organised into a number of divisions, each of which was identified by a letter (or letters) of the alphabet. 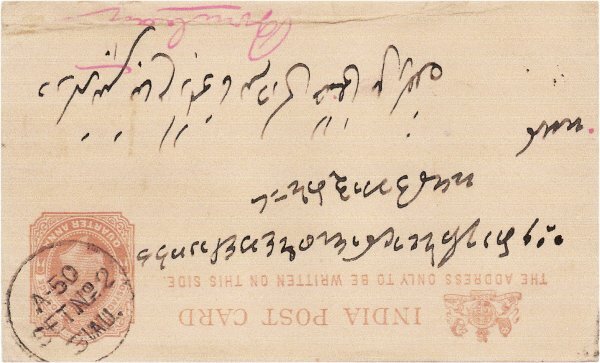 These code letters had in fact begun to replace the use of names in TPO cancellations from 1876/77. Examples of various standard types are shown below, but owing to the destruction of the records by fire it is seldom possible to establish individual routes at this time. In 1881, in order to reduce the amount of travelling sorting (owing to the high cost of providing crews) it was decided to set up a network of static sorting offices at important railway junctions. These were of two types, sorting mail offices which dealt with open and sealed bags, and transit mail offices which dealt with sealed bags only - both however accepted mail posted at the railway station! Again the cancellations used a code system, with numbers in the range 50 to 74 for sorting offices, and 75 upwards for transit offices. 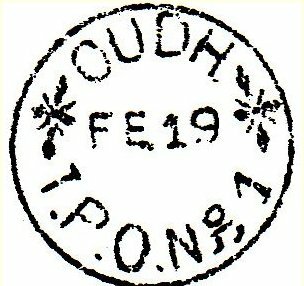 However, throughout the final years of the 19th and the early years of the 20th century, the Indian TPO system continued to expand (from 5300 miles in 1876/77 to 14400 miles in 1899/1900) and coded marks of the single ring type are common, although there are some hundreds of them. From about 1914 the single ring types began to be replaced by double rings of larger diameter, although the single ring types are known used on internal documents until the 1940s. For the period 1924 to 1955 information is available relating code letters to individual sections - the terms IN and OUT referring to the direction of travel to and from the headquarters or '?' of each TPO division. 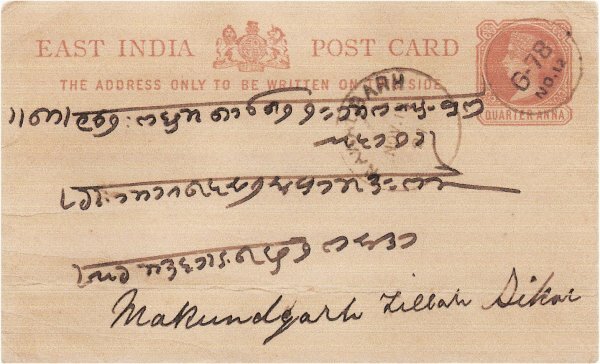 TPO operation finally ceased in India in the mid 1980s and it is no longer possible to post a letter into a travelling post office. 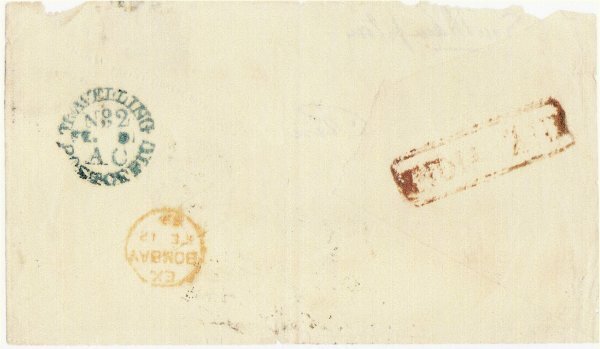 With a degree of perseverance however it is still possible to obtain a Railway Mail Service cancellation, after 127 years of continuous service in the delivery of the mails.